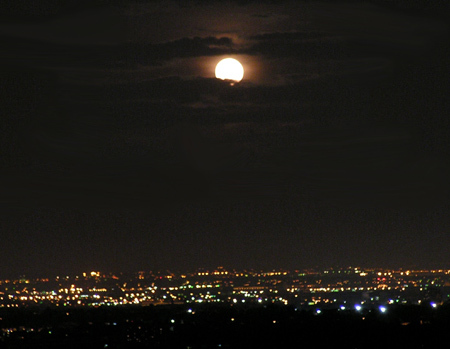 I SEE A JUNEMOON RISIN: One of my resolutions for 2009 is to get some good pix of a full moon rising. There's a nearby park with an overlook that's just about perfect, with a good south-east view of an urban horizon. The full moon usually rises around 9PM, a convenient time. 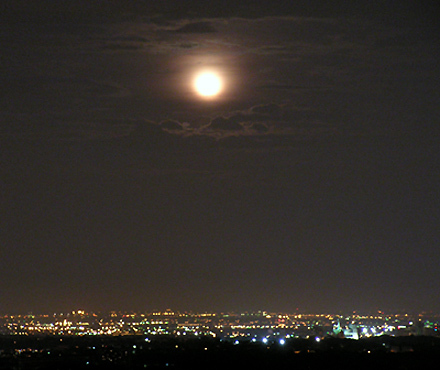 So, for the past two months, I've been trying to get some shots of a big yellow moon bubbling up over the city lights. But guess what? The weather was lousy both times. So, I've got to try again in another month or two. Last night, there was just too much smog and cloud cover on the horizon. But there appeared to be some breaks at around 30 or 40 degrees up. So I decided to wait it out, hoping that some interesting shots could still be had. The moon did eventually poke through for a few minutes, and I managed to get a few shots. I find it interesting that the major western religions, which for many centuries have denigrated the ancient nature-worshipping pagans that preceded them, still base their most important celebrations around the rising of the full moon. For Moslems, that would be Ramadan. For Jews, Passover. And for Christians, Easter (although they don't talk about it much). Well, I'm not into nature worship, but I do enjoy nature photography, so here are my shots from yesterday night. I didn't see any Wiccans building fires and dancing; but the Sheriff's Office wouldn't allow that anyway. And with such a beautiful view (and such beautiful pix) one might just expect to see moon worshippers out. Every time I see a full moon I think of primitive humans, or even closer in time, Medieval humans and the awe they must have experienced at seeing the full moon light up the night--especially since in those times the moon was closer to earth and appeared much bigger. Some time ago I found a beautiful prayer to Isis honoring Isis as "Mistress of the Moon". Among other titles she/it is called: Mother of Life, Mother of Earth, Mother of Love, Mother of Death, Refuge of the ill, the exhausted, the dying, Bearer or peace in times of sorrow, refuge of the abandoned, the betrayed--all your children taken to your breast, Mother of childbirth, healer, nurse, inspiration of poets, lovers, prophets of truth, Light of the World. When one sees the moon rise so beautifully, no wonder the ancients celebrated the Moon/Isis with all these beautiful titles and prayed to the Moon/Isis. Since I've found this prayer to Isis/Moon, I do not see the full moon without thinking in terms of this prayer. Oh, and once again--most beautiful pictures!